Do you want to share a moment of conviviality, creativity and fun with your family and friends? At Sweet Isabelle, we invite you to come decorate cookies either for a girls night out, a moment with your loved ones, your children, your grandchildren or your nephew / niece! We look forward to see you in our Montreal location (Ahuntsic, 2 steps from Laval) or at your own place with our mobile teams. • Decorative elements made of marshmallow fondant, colored sugars, royal icing, etc. You will wrap each cookie individually in cellophane with organza ribbon so that you can offer them to your entourage. Our 2nd visit to your shop on Fleury! What a beautiful activity! This time I brought my little cousin Alexane and she just loved it! I had the pleasure to have Frédérique taking care of us, for a sencond time. What a wonderful girl, she’s so warm and happy! A really really great workshop! I’m going to go back because I enjoy it so much. Again, congratulations for your shop. Thank you for the beautiful evening, an outstanding service, a great and fun activity for all ages, a beautiful atmosphere and a lot of pleasure... I look forward to come back! Do you wish to increase your creative spirit or that of your children in an original and “decadent” way? Here’s an experience that did not disappoint my sweet tooth: creating my own desserts at Sweet Isabelle. Thank you Isabelle for the beautiful evening! It was very pleasant and "entertaining"! My boyfriend had so much fun that he’d like to make it a yearly tradition!! Count on me to continue to promote your baking shop! See you soon! Thank you Isabelle for the wonderful evening yesterday... We had so much pleasure and it was a delight to meet you! Your initiative is really awesome! Keep your momentum, you bring much happiness around you! I went with my niece last Saturday to the cookie decorating workshop and it was really funny. I really loved it! And now I have to hold on for not eating all the cookies at once! My goddaughter also loved it. She already wants to go back! 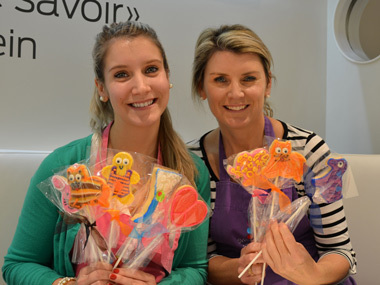 A very nice experience this cookie decorating workshop! My niece keeps very good memory of it. Thank you again. Great Friday evening with my niece, thanks to all of the team in Longueuil!!! What a great afternoon I spent with my daughter Carolanne decorating cookies! We’ll be going back for sure!!! Thursdays and Fridays, we take reservations for group of 4 and +, and Saturdays and Sundays for groups of 2 and +. Please do not hesitate to contact us if you have any further questions (phone numbers and email addresses in the next paragraph). Click here to view some workshop photos. Une relâche scolaire qui se mange! A cookie decorating workshop is the perfect activity for a family gathering filled with creativity and complicity! Looking for a couple's activity that combines pleasure, complicity and indulges your sweet tooth? 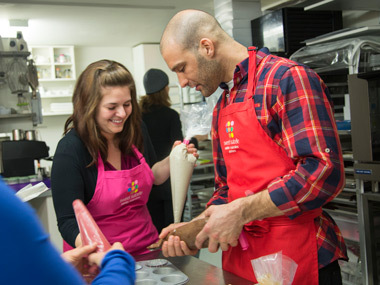 Our cookie decorating workshop are for you! Rest assured, men will let their creativity run wild alongside their sweetheart! 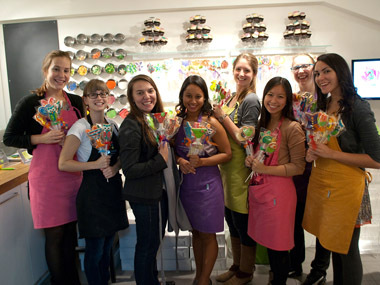 A girls’ night out at Sweet Isabelle is the perfect activity for a successful evening!